The new version of great game Bomb It. This small deviation from the usual style of play. Here you will defend 5 hearts of robots, aliens and monsters. They want to steal them all. Count in advance options where you will attack the enemy and do not let them win and steal the hearts of all. Place the bombs and mines to blow up the arrogant invaders that with each level more and more want to offend you. But you have played this game many times and quickly understand what's what. How to Play: your task is not to protect the heart. Find them in the game and decide where the best place to put a gun to brazen thieves exploded before you take at least one heart in his hands. 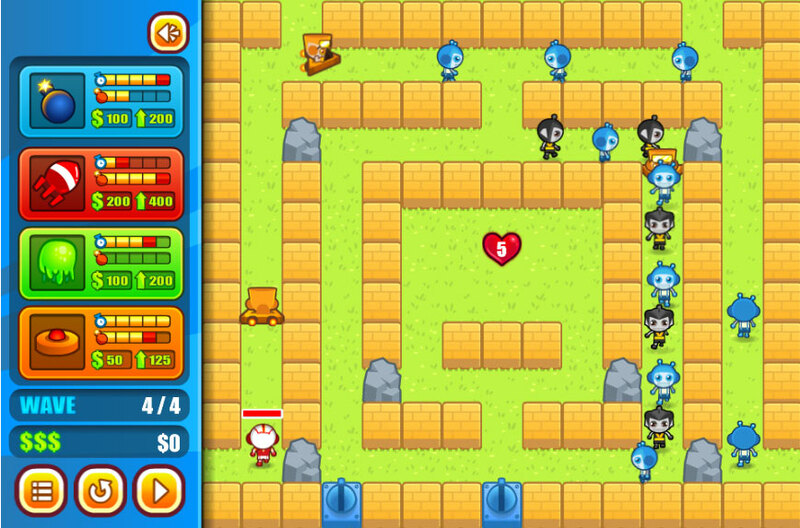 Earn coins and install larger mines and guns in time to repel the attack. After all the enemies are more and more! Played: 36612. Added: 16-12-2016, 10:21.